Matt Plutz, a Chemical and Biomolecular Engineering Research Scientist, spends his week immersed in the lab. He grabs a stool to settle in on and uses a microscope to make sure the yeast looks healthy prior to beginning a DNA transformation. He stays focused and precisely gets down to business: genome manipulation. Plutz has worked in the Center for Advanced Bioenergy and Bioproduct Innovation’s (CABBI) main lab almost since the Center’s founding. 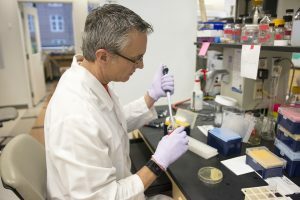 He joined Principal Investigator Christopher Rao’s group to work on bioenergy development after stints at several other labs across the Illinois campus. “I had never worked with yeast before this. 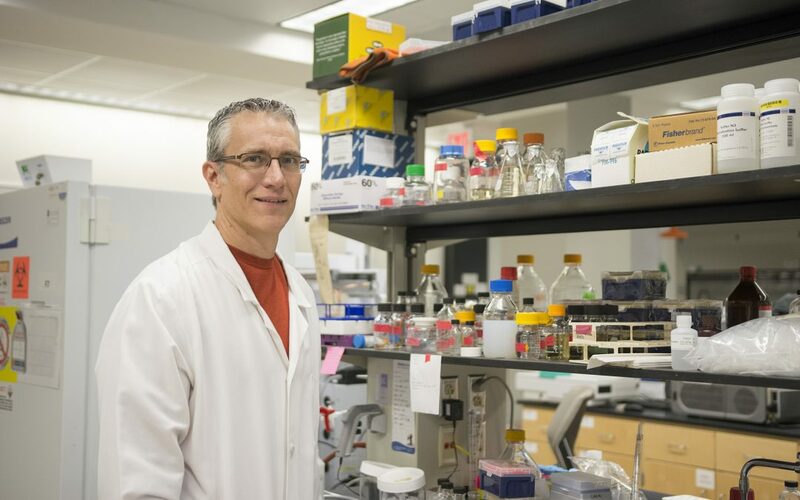 I work with an unconventional yeast, Yarrowia lipolytica (a specific type of yeast known for its lipid production) to convert the lipids to more usable, valuable products,” Plutz said. Though this is Plutz’s first time working with the micro-organism, his diverse professional and educational backgrounds have prepared him for switching gears seamlessly. Plutz graduated from Southern Illinois University with a Zoology degree before trekking to the University of Wyoming for his Master’s. An adventurer at heart, Plutz made the geographical leap because he wanted to study somewhere he’d never been before. His spirit for adventure never left. “I like to run, I bike, I like to spend time with my daughters, I adventure race, I travel,” Plutz said. He spends his time spotting for outdoor locations to run and hike through, like the Clinton Lake trail. And he enjoys the camaraderie of teamwork during his adventure races — competitive running and biking through typically rugged terrain to different checkpoints. Plutz humbly jokes that he’s really just a small cog in the bigger picture. But without the research conducted at every level, CABBI’s innovative progress would move at a different pace. Plutz enjoys the structure of his lab work. As part of the lab team, he’s tasked with manipulating the yeast genome to see how the yeast reacts. A common procedure is to randomly integrate genes into Y. lipolytica to learn what it does to the yeast cells. 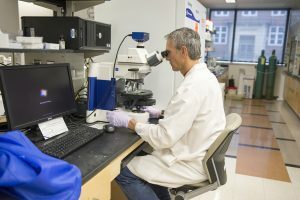 “From the lab, I hand off my work to another member of our team who actually tests the new strain to determine what products may come from it,” Plutz said. The end goal, and the core of CABBI’s mission, is bioproduct development. One purpose of Rao’s lab is to engineer microorganisms, like yeasts, to develop chemicals and fuels made from plant biomass. The cell structure of yeast makes it an ideal candidate for both engineering and bioenergy innovation. Though altering yeast genetics is a fairly simple task at face value, Plutz recognizes that it could be done more efficiently and accurately. Clustered regularly interspaced short palindromic repeats (CRISPR) is a tool used to modify and alter DNA sequences. “We’re working on using CRISPR to make gene integration and deletion faster and more accurate. Getting CRISPR to work for us will be the next step in our research,” Plutz said. Plutz is a staple in the CABBI lab, located in the Carl R. Woese Institute for Genomic Biology building. A lot of the specific tasks he’s handed are similar day-to-day, but that’s a part of the job he enjoys.